Hundreds of CUNY students take to streets, blocking traffic, heading from BMCC to City Hall March 5. The last eight months at the City University of New York have been dominated by a battle over cutbacks of state and city funding and increases in tuition for students. This is a big deal, since CUNY is the largest urban public university in the country, with over 240,000 students in degree programs on 19 campuses around the city, and another 270,000 non-degree students: over half a million in total. CUNY students are already paying through the nose for an education that should be free and open to all. That doomsday budget touched off a series of student protests, which the CUNY Internationalist Clubs actively participated in organizing, as well as a couple of demonstrations by the faculty union, the Professional Staff Congress (PSC). On September 22, CUNY Contingents Unite (CCU), an organization speaking for adjunct and other “part-time” CUNY faculty and staff in the PSC, called a demonstration at Paterson’s office in Midtown Manhattan which drew several dozen protesters (see “Adjunct Rebellion at CUNY,” in Revolution No. 5). On November 12, more than 200 students at Hunter College came out at the call of the CCU to protest the tuition hike and budget cuts, including many black and Latino students. (Two-thirds of CUNY undergraduates are non-white.) More than 20 students spoke from an improvised “soapbox” (actually a milk crate), telling what effect a tuition hike would have on them and their families. It was exciting, and many were quite militant. Chants included: “No budget cuts, No tuition hike!” “Education is a right, Fight, fight, fight!” “Whose CUNY? Our CUNY!” and “Lay off Goldstein!” the CUNY chancellor with his obscene $500,000 salary. There followed protests on December 8, December 16, March 5 and March 25. The biggest was March 5, when hundreds of CUNY students (many from Hunter, where a walkout and rally drew 300 participants) joined with a contingent from the PSC and 75,000 city workers to protest the attempt to balance the state budget on the backs of working people. Students poured into the streets, marching from Borough of Manhattan Community College to City Hall chanting, “Students and labor, shut the city down!” echoing the headline of our March 5 leaflet. You could see and feel that together we had the power to do just that: shut down New York City. The student/labor rally at Hunter College on March 25 was another important step forward, with endorsements and participation from a number of workers groups, particularly immigrant workers, transit workers and strikers from the Stella D’Oro bakery in the Bronx, as well as quite a few students. Many of the speakers who addressed the crowd of 200 emphasized that this was only the first step in a long, hard fight, but that together, working people have the power to stop the budget ax murderers and tuition hikers (see excerpts from speeches on pp. 6-7). So after months of student protests and a couple of demonstrations by the PSC, the state budget was approved in early April. The result: state aid to senior colleges and city funding of community colleges was cut by $75 million dollars, but for the senior colleges’ actual budget cuts were averted by funds from a big $300 per semester (15 percent) tuition hike. CUNY officials are crowing that they were able to “restore” some $18 million in cuts to the community college budgets from Paterson’s original budget. What they are mum about is that funding of CUNY community colleges will fall even as enrollment goes up. So the only reason there isn’t a whopping cut in the CUNY budget next year is because they’re soaking the students with the tuition increase. $22 million of this is to go to the City University operating budget, another $88 million will go straight to the state as a regressive tax on students, one of the sectors of the population least able to pay. (SUNY students are due to pay an additional $155 million.) These aren’t just numbers. This tuition hike will mean thousands and possibly tens of thousands of students will have to drop out of school. After a $750 increase in 1995, CUNY enrollment dropped by 20,000 (from 1994 to 1998) and didn’t recover to the previous level for eight years. The dirty secret is that CUNY authorities got pretty much what they wanted out of this “crisis budget” – no major cuts in the operating budget – while students got shafted. 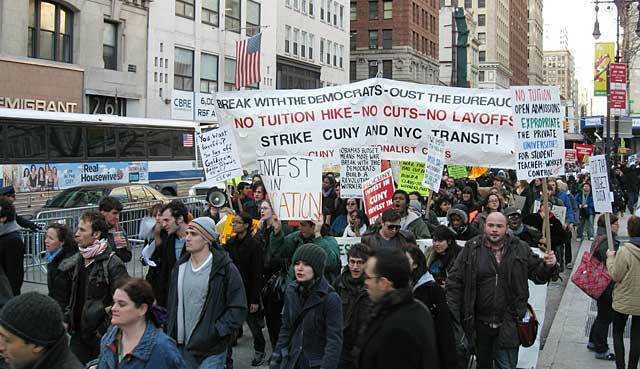 In fact, the push for higher tuition came from the CUNY administration and Board of Trustees. And it was approved by the Democratic governor, the Democrat-controlled state senate and the Democrat-controlled state assembly. At bottom it is a class purge. It is part of the war on open admissions ever since action by student militants and the labor movement opened the gates of the City University to New York City high school graduates in 1969, instead of only an (overwhelmingly white) elite layer. The people who run the City University for the ruling class want to reverse that. CUNY authorities are doing their best to replace many working-class students. While they claim that the impact of a tuition increase will be minimized by federal Pell grants and the state Tuition Assistance Program, most working students unable to take a full course load get little or no federal or state aid. Now the state government says it will “help” those students by setting up a state loan program – meaning that students will be saddled with huge loans that they will spend years paying off. CUNY figures it can do this because it is now attracting middle-class students who can’t afford to go to Ivy League schools as a result of the economic crisis. This is part of a push for increasing privatization of public higher education. Thus in the middle of the battle over the budget, CUNY announced with great fanfare that it had reached its $1.2 billion fundraising goal three years early. Chancellor Goldstein said this was “because the reputation of the university has really been burnished over the past several years” – that is, after abolishing the remnants of open admissions in 1999. The kind of students CUNY wants to attract are those who will contribute big bucks to an endowment after they start earning six- and seven-figure salaries. And those won’t be poor and working students from the Bronx and Bushwick. Yet low-income black, Latino, Asian and working-class white students are precisely who the City University should be serving. City College was set up a century and a half ago as the Free Academy of New York. While fighting tuition hikes and budget cuts, we in the CUNY Internationalist Clubs call for open admissions and no tuition, plus a living stipend to make it possible for poor and working-class students to attend university. Free public higher education should be a democratic right for all: expropriate the private universities. We also fight to abolish the Board of Trustees, replacing it with student-teacher-worker control of the university. This cannot be achieved simply by mobilizing students, who can sometimes be quite radical, but who lack the kind of social power that workers have: to stop the production, transport and communications that capitalist society depends on. At various times during recent protests, people have raised calls for “student power.” The CUNY Internationalist Clubs counterpose to this a call for students and workers to unite in struggle against the capitalist rulers who oppress us all. The struggle against tuition hikes and budget cuts cannot be limited to CUNY. What we are fighting against is a broad-scale offensive against workers and the oppressed. We have gone all out to mobilize against the current round of attacks, while emphasizing a basic point: we won’t succeed in defending our interests by endless guerrilla warfare. It is necessary to mobilize all the exploited and oppressed in a fight for workers revolution. That has to be an international fight, as capitalism is a world system. In the convulsive events of 1968, student protests from France to Mexico directly intersected the struggle of the working class. Today, the upsurge in Greece and huge strikes in France hold lessons for us here. What we’re fighting for goes way beyond stopping the tuition hikes. Economic crisis and the reality of endless war are leading many students to ask some serious questions about the society we live in. We invite you to join with the CUNY Internationalist Clubs to help win new forces to the cause of international socialist revolution.